The former First Lady hopeful is opening up about her hubby's affair with filmmaker Rielle Hunter -- calling it a "terrible mistake," reports AP. 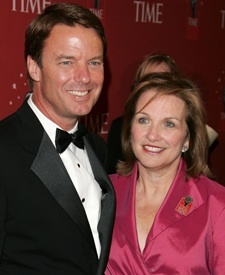 Elizabeth, who admits that it was hard when her senator hubby 'fessed up to the affair in 2006, states that after a "long and painful process," the senator's brood is standing behind him. Mrs. Edwards added that she was proud of the courage John showed in admitting to his infidelity with Hunter -- who has previously denied the affair, but told "Extra" in 2007, "The whole experience [of working with Edwards] was life altering for me." The statement concludes with the Edwards family requesting privacy throughout this ordeal.